You don't realise it at the time, but opening with a near silent scene of Richard and Mildred Loving (Joel Edgerton and Ruth Negga) sat on the porch of Mildred's home looking out into a field at night is a pretty telling way for the film to begin. Loving, written and directed by Jeff Nichols, is a very quiet film. It finds its home in wordless sequences, its soundtrack barely registers above a whisper, and its lead actors are never given a chance to emotionally erupt. It boasts astonishing self control, but is self control really what this story needed? 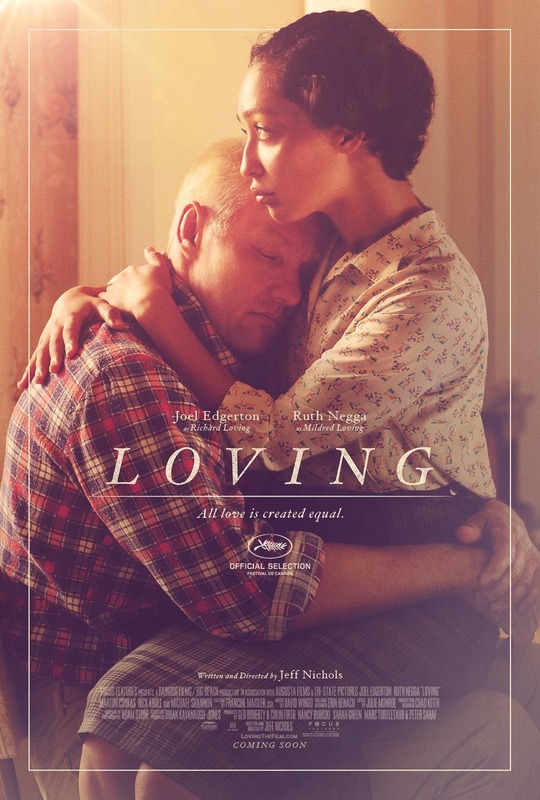 Loving tackles the true story of Richard and Mildred, who were forced out of their home state purely because they are an interracial married couple. Angry at the way they've been treated, Mildred contacts Robert F. Kennedy, who refers them to the American Civil Liberties Union. Their case starts to make small waves within the Union, and their lawyer believes they have a chance of bringing their story to the Supreme Court and potentially changing the U.S. Constitution. It's an undeniably moving story, but Loving isn't a particularly moving film - its emotional side barely surfaces. This is a story that should be loud and powerful and angry, but instead it's calm and mellow and peaceful. It's admirable of Nichols to tackle the film in this way, it gives it a completely different tone and feel to any other similar true story in recent memory, but the under dramatisation of it all can't help but leave you feeling a little cold. Nichols' self control with crafting this film is sensational, but it feels misplaced. Loving's opening half is also too slow. We're immediately drawn into the story by the strength of Edgerton and Negga's performances, but it doesn't take long until you feel your interest start to slip away. Fortunately, once Loving does start moving - around the time they first attempt to break back into Virginia so Mildred's baby can be delivered by Richard's mother - the film remains interesting until it ends, it just doesn't reach this point quickly enough. It's another reason why the soft approach damages the film - there's no big, shocking moment to hook you. Respectfully, Loving does manage this eventually, but it just takes far too long to grab you and its refusal to offer anything substantial early on is frustrating. An ordeal like the one Richard and Mildred go through must be horrendous to endure and by sidestepping all of the tougher moments Nichols' film doesn't properly reveal the ways this situation impacts its characters. By the time the credits roll, we're left thinking "aw" rather than "wow". Luckily, though, Edgerton and Negga are on hand to keep us interested. Edgerton is given a much wider range of material to play with - he's allowed to properly demonstrate anger, for one - but Negga transforms her quiet character into someone you feel profoundly drawn to. In a film where lots of bad things happen, even if almost always off-screen, Negga feels like a comforting pillow. She works the film's under dramatic tone to her advantage, you feel safe and secure and warm whenever the spotlight shifts to her. Her Academy Award nomination is both surprising and fully earned - it's surprising because she isn't given that typical "big Oscar moment", but earned because what she does do is superb. The film works best in its quietest moments, when the dialogue is pushed aside and scenes unfold without one spoken word. Richard and Mildred's first return to their home state is completely without dialogue, but the glare of car headlights and the eeriness of the empty roads craft it into a sequence riddled with tension. Loving also finds its most powerful display of affection between Richard and Mildred as they silently watch TV in their living room, Richard lying across the sofa with his head in Mildred's lap as a photographer sits silently in the chair next to them. 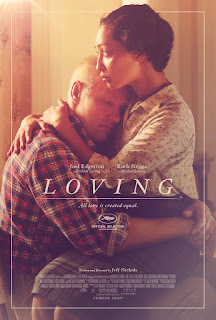 Loving is a film about a famous legal battle, so its toning down of the drama and emotion does damage it in the bigger moments but it's also what makes these wordless sequences so effective. By cutting the dialogue for small infrequent bursts, Loving turns its under dramatisation into a unique and thoughtful atmosphere, it's just a shame these sequences don't come around all that often. The film's visual style is in-keeping with the tone, too: it's nicely shot, but never anything noteworthy. It's occasionally too on the nose as well - a lawyer's speech is placed over scenes of Rich and Mildred doing typical family things, like enjoying dinner and putting the kids to bed. It seems to forget that the audience watching the film is very different to the audience who would be watching the film if it released in the years it's set, but it's tough to criticise the film for this. 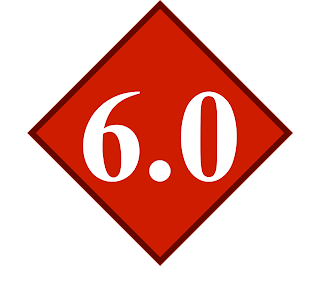 Loving is well crafted and well-intentioned, there's just no bite. Joel Edgerton and Ruth Negga turn in top notch performances, but Loving's under dramatic tone fails to do its powerful true story much real justice.